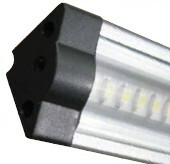 The new LED Triangular Strip and Low Profile LED Puck offer a versatility not offered by any other product. The Triangular Strip can be easily mounted into a corner or behind a valance to offer a clean and neat installation. Available in Natural and Warm White options you are sure to find a look that you will appreciate. Offering long life and easy installation this product will be a hit. 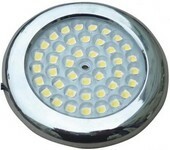 The 3 Watt RAB LED Undercabinet Ultra Thin Puck Light is less than 1/4" thick and 3-1/2" in Diameter. This Puck Light will work in systems with the Flat and Triangular Under Cabinet products to provide the most versatile options for challenging layouts.